Cargo Control Lever Action Cargo Bar Lowest Prices for the best truck bed accessories from Erickson. 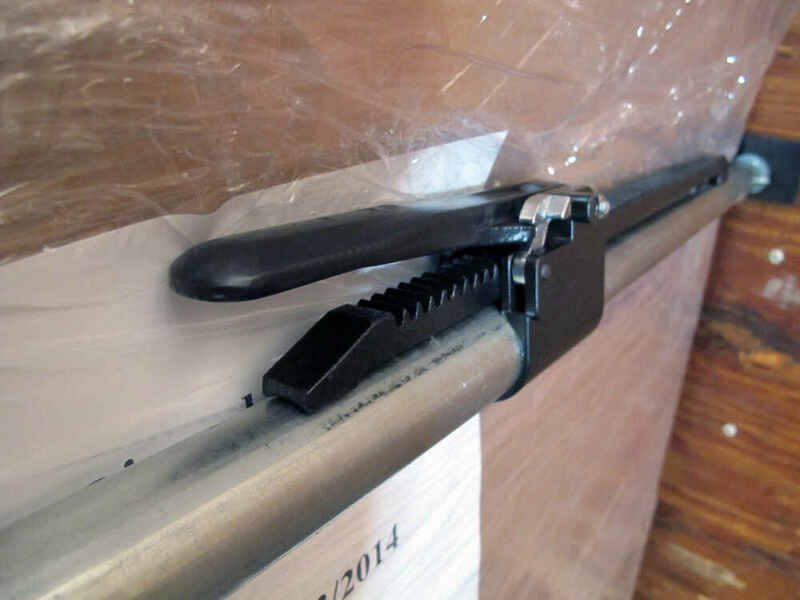 Industrial Deluxe Lever Action Cargo Bar, 89" - 104" part number 08906 can be ordered online at etrailer.com or call 800-298-8924 for expert service. Adjusts from 89" - 104"
08906 Lever Action Industrial Cargo Bar, 89" - 104"
Video of Industrial Deluxe Lever Action Cargo Bar, 89" - 104"
Today we're going to be taking a look at the Erickson Industrial Deluxe Lever Action Cargo Bar. This has a span of anywhere form 89 inches up to a 104 inches. The part number on it is 08906. The Erickson Industrial Cargo Bar has been designed for commercial use and holding our load secure while traveling. We can just push it over the silver tab that keeps our handle in place, and keeps it from moving. 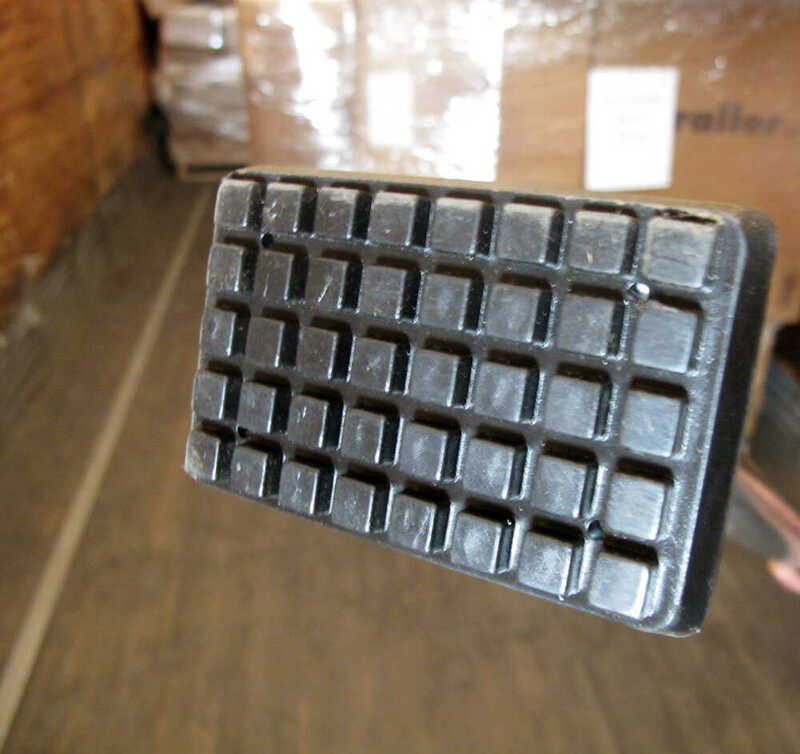 The foot pads themselves are a hard rubber composite material, so it's going to be nice and grippy when we get it on the side of our trailer. As you can see, they've got this slots cut through, so any moisture, dirt, debris really isn't going to inhibit this holding against the well. As you can see, each pad that meets the wall is going to have a little pivoting foot on it. That way, if we don't have it exactly centered or exactly square, it'll still made up perfectly and give us a good connection point with the side of our trailer Now that we've gone over the features of our cargo bar, let's take just a minute to see how it installs. We'll first open hour large black lever until lays flat completely across. We'll make one side up against one side of the trailer, slide the other side out until it makes contact, and then we'll simply pull our lever over until it catches locked. That's going to hold it in place. 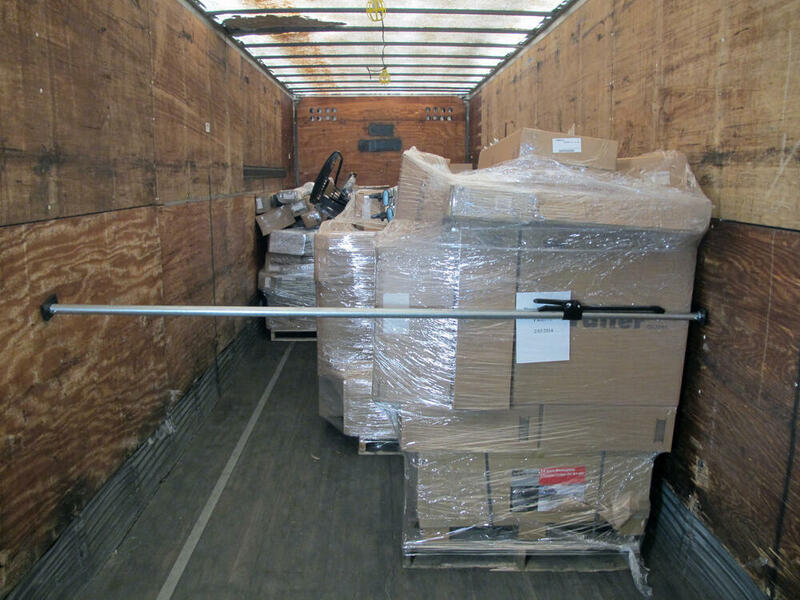 It's going to keep our cargo from shifting around as we drive, and keep it from moving on. That'll complete today's look at the Erickson Industrial Deluxe Lever Action Cargo Bar. The part number on it is 08906. .
Do you have a question about this Truck Bed Accessory? 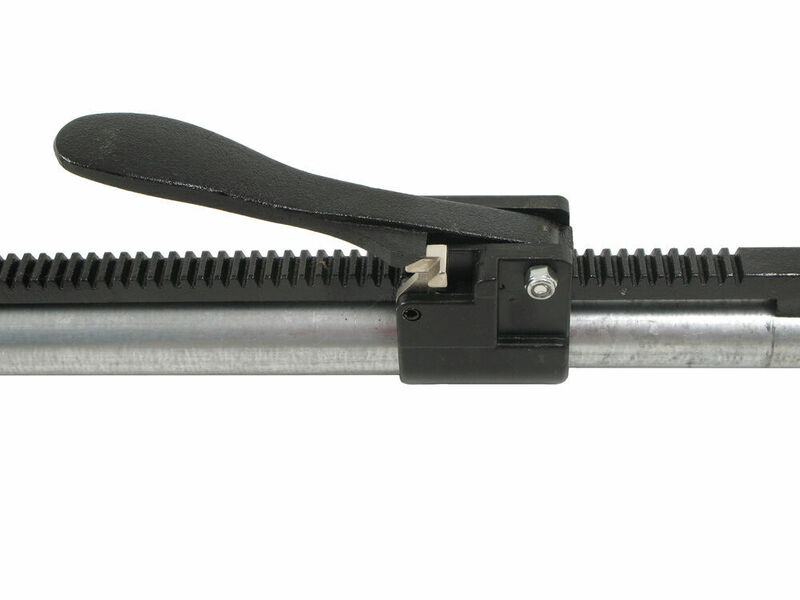 The working length for the Industrial Deluxe Lever Action Cargo Bar, part # 08906, is 89 inches through 104 inches. Unfortunately, we do not have a cargo bar that will work for a bed width of 84 inches. I went out into our warehouse to measure one of the Industrial Deluxe Lever Action Cargo Bars # 08906 that we have in stock and found that it has two diameters. One portion of it is 1-1/4 inches thick and another portion is 1-1/2 inches thick. The Industrial Deluxe Lever Action Cargo Bar # 08906 does not have a weight capacity for the application you are interested in. But I can assure you it would do fine with hanging clothes on it to dry. This is designed for commercial use to stabilize pallets in a semi-truck trailer so it would have no problem with clothes hanging it. 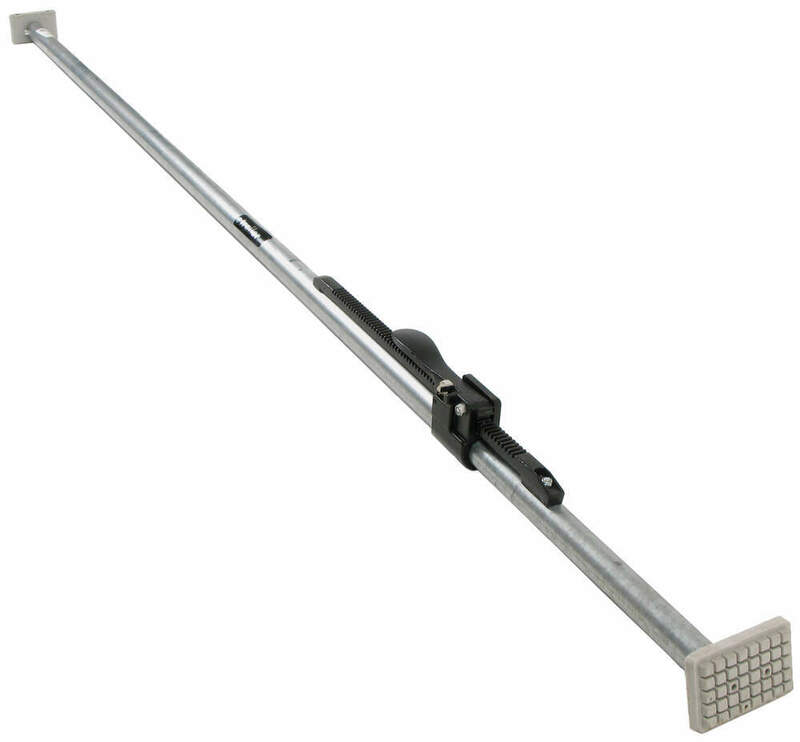 I spoke with my contact at Erickson who said that the Industrial Deluxe Lever Action Cargo Bar # 08906 is made of aluminum and the lever itself is made of steel. Highest quality truck bed accessories for the best price. Most detailed, accurate truck bed accessory information available.